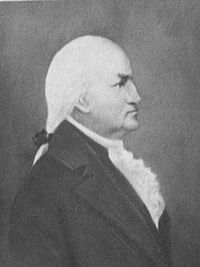 Today in Masonic History Simmons Jones Baker is born in 1775. Simmons Jones Baker was an American physician and politician. Baker was born in Hetford County, North Carolina on Febuary 15th, 1775. At a young age Baker's mother passed away and part of his youth was spent with an aunt in Virgina. While living in Virginia he attended school with William Henry Harrison. In 1793 Baker traveled to England to study medicine, a common practice at the time. There is no evidence of him attaining a medical degree, he did receive certificates from two prominent medical facilities in Britain, one in London and one in Edinburgh. In 1795 he returned to North Carolina. In 1814, Baker was elected to the North Carolina House of Commons, now the North Carolina House of Representatives. He would serve in the House of Commons until 1816 when he would be elected to the state Senate where he served until 1818. While in the Senate Baker was part of the legislation that would create the Supreme Court of North Carolina. He also with fellow legislators would become very excited about the Eerie Canal, thinking that they may be able to do something similar in North Carolina. Eventually the plan was abandoned. In 1828 Baker moved to Florida and acquired a large amount of land near the present town of Mariana. Baker was very active in the Episcopal Church in both North Carolina and Florida. Baker was one of the founders of Trinity Episcopal Church in Scotland Neck, North Carolina. He also help found St. Luke's Church in Marianna. Baker died on August 18, 1853. Baker was initiated in 1812 to Concord Lodge No. 58. He would be elected Grand Master of Masons of North Carolina in 1832 and 1840. He would serve as the 18th and 22nd Grand Master of North Carolina. During his first term as Grand Master he he laid the corner stone of the capital building in Raleigh.